Bamboo and cork are attractive options as a renewable-resource building material for flooring. Above: Teragren “Signature Naturals” flat-grain with caramelized finish. 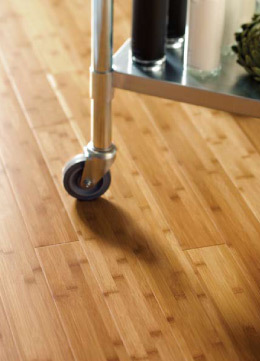 Cork and Bamboo have been cited as “green” friendly floors due to their ability to replenish themselves quickly. Cork floors are made from the bark of cork trees. After the cork bark is harvested, the tree will regrow its bark, and be ready to harvest again in 9 years. Cork floors are also quiet due to their natural sound absorbing properties. Our Quick Cork floor comes in 1 foot by 4 foot panels which are tongue and groove ‘clicked’ together over a thin vapor barrier. It comes in numerous colors and patterns. Although it is maintained and installed similarly to hardwood, Bamboo is technically a grass. Like cork, the bamboo plant can be repeatedly harvested (every six years), making it a replenishable resource. Bamboo is preferably nailed down over a wood subfloor. However, it can also utilize a glue down, or floating installation. The natural and carmelized (steamed) colors are the most popular. Stained bamboo is also available. Synergy Strand is a unique 100% bamboo product which compresses bamboo fiber under extreme pressure to create a floor which is 100% harder than red oak. Ideal for commercial as well high traffic residential applications. Call or click today to set up a free no obligation shop-at-home appointment with one of our design consultants.